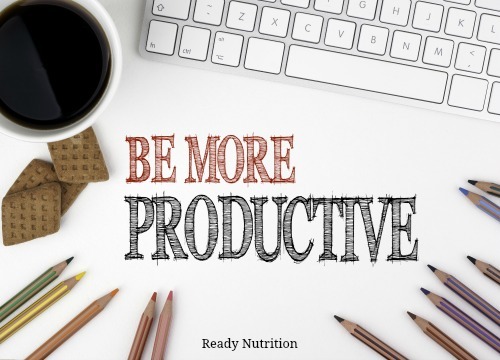 Be More Productive: 5 Books To Improve This Life Skill Today! Whether you’re a stay at home mom, a busy entrepreneur or working in a fast paced office, these five books will help you make your time more efficient and productive! It’s been said that the two factors that have the greatest impact on a person during adulthood are the people they meet and the books they read. As we get older, it becomes more and more difficult to make new, lasting connections with other people, but there’s no excuse not to be always be reading a book. I make reading a mandatory, non-negotiable hour of every day (I sometimes have to schedule it in like a doctor’s appointment, but it always gets done!) and it’s proven to be invaluable to me. Reading books about productivity instantly makes me feel more productive—it’s definitely easier to motivate and plan for success with a guidebook. Whether they are about organizations, tips for time management, or methods for organizing clutter, this list contains some of my all-time favorite books for jumpstarting my productivity. 5 Books To Improve Your Productivity Today! This book came out in 2002, though I didn’t read it until around 2008, after a new job required me to become familiar with these methods. From managing your inbox to overcoming writer’s block, this book is full of helpful hints and tips for accomplishing your goals. The basic tenant of The ONE Thing is kind of a no-brainer: in order to accomplish anything, you have to focus your priorities and be protective of your time and effort. You have to be relentlessly devote yourself to a single task. It’s so very easy to be distracted in this day and age, and Papasan’s book touches on effective methods for getting larger projects finished and quieting the “noise” of our modern world. Yes, this is THAT Brian Eno, immensely talented glitter rocker and musician who has collaborated with David Bowie and endless other artists and performers over the years. The original Oblique Strategies are a deck of cards that can be flipped through during a project. Now, you can access these tips and tricks for free online (although I still prefer the physicality of shuffling through a deck). With advice like “Don’t stress one thing more than another” or “Make what’s perfect more human” this advice is sometimes odd, sometimes obvious, and always helpful–especially for your more artistic endeavors. In the vein of Oblique Strategies, at first glance The Artist’s Way seems to be most helpful for artists and creative, but the strategies really lend themselves to any project that requires intense though (i.e. ALL OF THEM!). It’s the seminal book about creativity and the 12-week program will help you to map out ideas and kickstart new ways of thinking. I’ve written about this book a ton and I’ve talked about it even more. Kondo realizes that in order to be productive or successful in any endeavor, we have to get our personal space in order first. I’ve applied these principles not only to my work-space, but to my life in general. There’s a reason this book is on everyone’s list this year. What are your go-to books or websites when you’re trying to get amped up for a project?